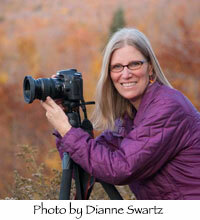 Orah Moore owns and operates Haymaker Press in Hyde Park,Vermont, publishing her photographic images as greeting cards, posters, and books. She is also a freelance photographer for Vermont Magazine covering their farm stories and a long-time wedding and portrait photographer. Please see orahmoore.com website. At twelve years old Orah began taking photographs with her grandfather’s old Kodak Retina II. She grew up in the Finger Lakes region of central New York and spent her college years on the West Coast, earning a B.A. in Fine Art Photography from San Jose State University and a M.A. in the same subject from California State at Fullerton, studying with Photo-Muralist Eileen Cowin. Continuing her study of photography, Orah took workshops with Ansel Adams, Ruth Bernhard and Ralph Cooksey. She was influenced by their passion for the art and craft of photography. These teachers instilled in Orah a desire for excellence, a keen eye for discerning light, and the patience to work with subject and image, coaxing them into reality—a type of pre-visualization mixed with anticipation. 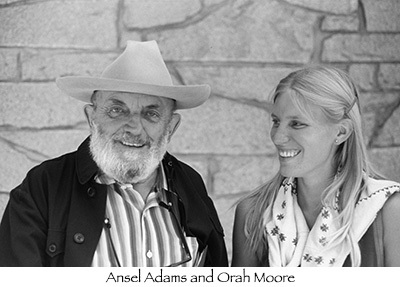 In 1975 Moore studied under Ansel Adams attending one of his many Yosemite workshops. After the workshop she followed up with a visit to his Carmel, CA home where he gave Moore a review of her portfolio. Moore can credit much of her spirit of dedication and total love of the medium to her mentor, Ansel Adam's. When she’s not hiking or driving back roads in search of the perfect shot, Orah is often paddling her kayak across quiet waters in photographic pursuit of another passion: loons.